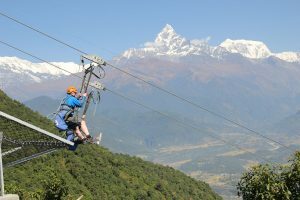 Zip Flyer Pokhara is one of the world’s most incredible zip lines. It is completely a new type of adventure activities that will push your adrenaline to the max! So Challenge your spirit as you take on thrills, excitement, and fun as you have never experienced before. The moment of madness, the feeling of utmost excitement, the sense of being free! Flyer through the clear, beautiful, picturesque vistas with the Annapurna range ahead and the dense green forest canopy below… It will, without a doubt, be the most awesome experience. Zip Flyer Pokhara consists of a trolley mounted on a steel cable 1.8 KM in length; the ride descends 2000 vertical feet at an angle of 56%. With resulting speeds of over 90 miles per hour, this makes it the most extreme zip line ride in the world. The entire system is manufactured and precision engineered to equal or surpass standards set by agencies such as ANLS B77 Tramway, ASTM, and TV SUD codes. Price: NRs 4200/- Per Person for Nepali Citizen, NRs 8200/- for Indian/ Chinese Citizen and USD 82 for Other Citizens. It includes pickup and drops from Lakeside. Video & Photographs Extra Cost: Rs 2500/- Per Person for all nationality. This ride is not recommended for individuals with back or neck problems, or those who are pregnant. Videos and pictures of your ride will be available at the end of your ride. However, you should book your helmet cam video when you purchase your ride. The Cost and Schedule subject to change with or without prior notice. Please contact us for updated final price.